Every summer, I vow to endure the hellish heat and make the most out of the sunny days! The soaring temperature can be punishing sometimes. Well, yeah, cross that out. It is punishing most of the time. But I couldn't just stay in our room all summer long, especially when there's so much going on outside! So, to kick off summer this year, Ed and I headed to Khalifa City in Abu Dhabi! Our main agenda is to stay in Marriott's newest baby - Marriott Hotel Al Forsan, and to check out the latest adrenaline rushing activity in the UAE - Wakeboarding! Marriott Hotel Al Forsan is the latest Marriott property in the capital. It is a 5-star hotel situated in the heart of Al Forsan International Sports Resort. The luxury accommodation has 400 well-appointed rooms and suites, 6 dining options, a spa, hammam, and fitness center, a 50 m lap pool, an outdoor leisure pool with a kids zone, and unique recreational activities like horseback riding and hunting! The hotel has a contemporary and sophisticated interior. The lobby is accentuated with fresh pink flowers which gave the classy ambiance a more welcoming vibe. Upon arrival, we were ushered to the front desk where we had a smooth check-in process. We stayed in a Deluxe Room and could hardly believe that it is the lowest room category in Marriott Hotel Al Forsan. Throughout our stay, we felt like we are in a top-notch suite! The room is very spacious, thoughtfully designed and elegantly furnished. I love the cozy featherbed mattress! Don't we all love a room with a view? Our room has a balcony offering a panorama of the sprawling outdoor pool and the upscale Al Forsan Village nearby. Although the weather was hot and dry, we opted to spend a downtime in the terrace and revel in the view! calm summer morning | Can you see the Aldar HQ? I am still in awe every time I recall our experiences in Marriott Hotel Al Forsan. I am particularly impressed with the versatility of the 5-star hotel! It could be a venue for rest and relaxation. It could also serve as an active holiday accommodation as it is just a short walk from the Sports Resort. Saray Spa: It is where I had a 60-minute Me Time! My skin was thoroughly pampered by a well-trained therapist. June Jacobs spa collection was used, leaving my skin naturally rejuvenated and glowing! Saray Spa Fitness Center: While I was having a facial, Ed burned some calories in the gym. He said the fitness center is fully equipped with high-end facilities. Outdoor Pool: The swimming pool is massive! It is lined with palm trees and sun loungers, giving the hotel courtyard a tropical atmosphere! 50 Meter Lap Pool: I bet serious swimmers would love this! Wakeboarding and other activities at Al Forsan International Sports Resort: To my thrill-seeker husband's delight, Marriott Hotel Al Forsan is within walking distance to the Sports Resort. He went wakeboarding for the first time and he had a blast! Needless to say, he look forward to doing it again! Note: Activities at Al Forsan International Sports Resort are not included in the hotel stay. 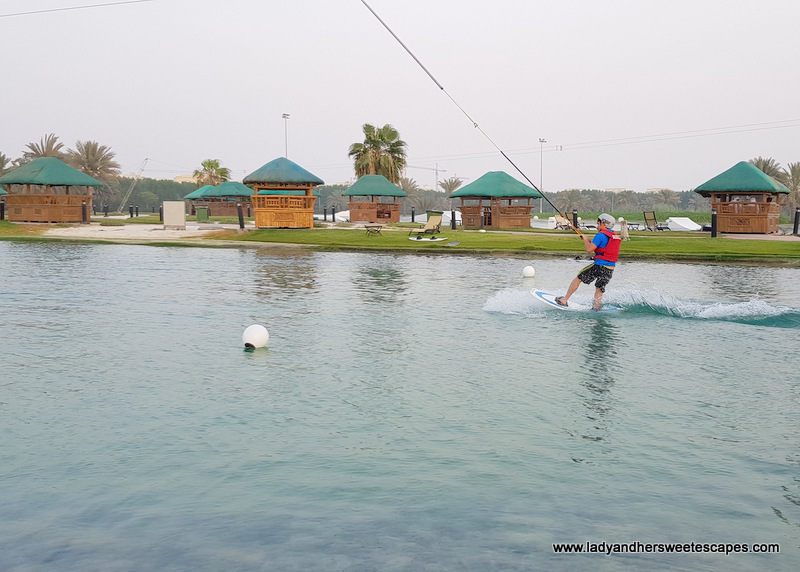 Wakeboarding costs 140 AED for 1 hour. Nothing beats summer mornings in the pool! Marriott Hotel Al Forsan could also pass as a foodie destination. There are 6 restaurants/cafes in the property; each caters a different dining experience. We had the pleasure of dining in two venues. Dinner date was at The Grill, and breakfast was at Al Khayal. Marriott Hotel Al Forsan's elegant steakhouse restaurant wowed us during dinner. The restaurant is sleek and stylish. We were well-taken care of; Sergey, particularly, guided us through the menu. He gave superb suggestions on food and wine to pair! The Chef visited our table and plated our main course right before our very eyes. Ed and I agree that it was highlight of our date night. Whole Rack of Lamb (415 AED): Perfectly cooked. Utterly delicious! Good for 2 to share. If The Grill is suitable for date nights, Al Khayal is perfect for family meals! It is Marriott Hotel Al Forsan's all-day dining restaurant, and the bright ambiance is a joy to the senses. The spread for breakfast is huge. It is actually one of the biggest breakfast buffets I have seen to date. The choices are endless. I could either have a full English breakfast, a traditional Arabic meal, an Asian breakfast, or I could give my day a healthy start! So, I settled with a heavy English breakfast! Right at the very start of our stay at Marriott Hotel Al Forsan, Ed and I were already talking about how professional and friendly the staff are. And our conversation continued after checking out. Everyone that we met at the hotel are commendable. Their smiles are genuine. They are attentive. And most importantly, they provided competent service. 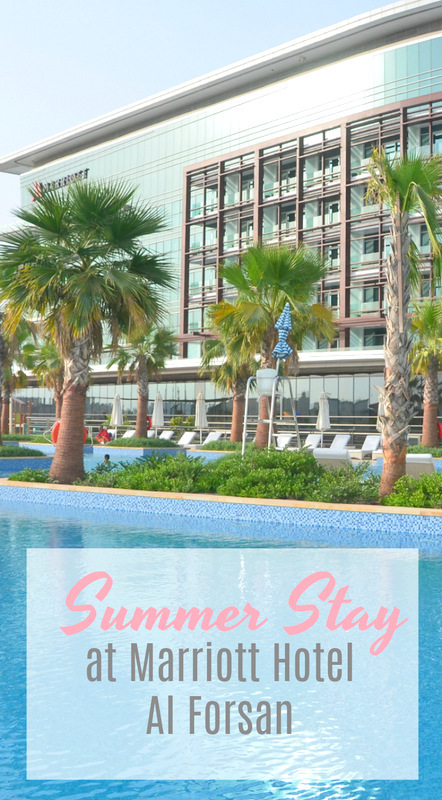 We had a fabulous stay at Marriott Hotel Al Forsan. The hotel is quite distant from the city center (20 minutes away by taxi from the bus terminal), but it has everything we need for a fun and memorable summer weekend! We were invited to stay at Marriott Hotel Al Forsan. Opinions in this blog post are my own.